The Convention on Biological Diversity (CBD) aims to conserve and sustainably use biological diversity and share the benefits of genetic resources equitably. The 193 countries party to the CBD are revising their national biodiversity strategies and action plans (NBSAPs). Done well, these could help integrate poverty alleviation with environmental policy, plans and investment and support both development and biodiversity objectives. The first phase of the project, funded by the Darwin Initiative, focused on supporting four countries – Namibia, Uganda, Seychelles and Botswana – to revise their NBSAP, incorporating development concerns into the plan in order to support poverty reduction and social inclusion. The project finished in March 2015 and much of the content on these pages reflects what was achieved and the experiences of the project members. The second phase of the 'Mainstreaming biodiversity and development' project started in April 2015 and finished in March 2017. It aimed to take the lessons from the revision process into the NBSAP implementation phase, to engage with national development processes and build relationships beyond environment ministries. The project involved the original four countries and brought on board Malawi, Zimbabwe, Ghana and Zambia to expand the Mainstreaming Biodiversity and Development Africa Leaders' Group. Working in collaboration with the UN Environment-World Conservation Monitoring Centre, the project built capacity for biodiversity mainstreaming, developed tools, provided technical support and shared learning. 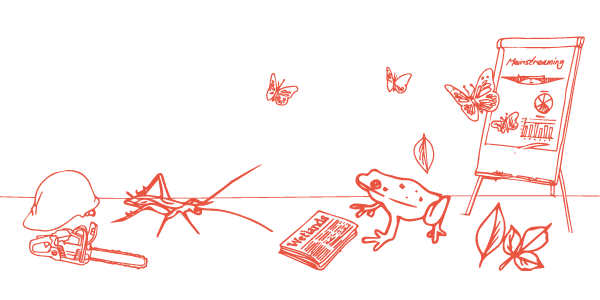 Find out who's who in the project and watch a series of short films on the challenges of mainstreaming biodiversity. Showcasing and sharing experiences of where mainstreaming biodiversity into planning and policy has been successful. As part of the project, representatives from five countries came together to exchange their experiences of mainstreaming biodiversity across government and society. Their stories of progress – 'stories of change' – describe small, everyday changes with the potential to turn into something big, and should inspire and encourage others to look for their own stories of change that can make a difference to how biodiversity is valued, used and protected. Enhanced awareness of biodiversity values among development planners. You can watch Dineo Gaborekwe from Botswana make a 'Dragons' Den' style pitch for the business case for biodiversity being included in development planning. In a series of interviews we review how countries are mainstreaming biodiversity through their NBSAPs. Camila Oliveira, environmental analyst in the Ministry of the Environment in Brazil and national manager of the project Biodiversity for Food and Nutrition (BFN), describes her involvement in mainstreaming biodiversity into nutrition policy. And you can read about how the South African National Biodiversity Institute (SANBI) in South Africa is involved in mainstreaming biodiversity in our interview with Fulufhelo Mukhadi. This guide is aimed at people who are involved in national or sectoral development planning and want to highlight how biodiversity contributes to economic and social development and make sure that opportunities and risks are no longer ignored by development policy, plans and budgets. It may also be useful for those who are developing or revising an NBSAP and want to check it supports poverty reduction and social inclusion. Provide information about helpful tools and approaches that have been tested in African contexts. The guidance will support readers to acquire the ability and skills to select, assemble, analyse and present compelling evidence on the links between biodiversity and national development priorities, and to develop a communication strategy to support all these aims. The contents is based on the learning and experience of the African Leaders' Group, representing eight African countries. This guide addresses how to mainstream biodiversity into development. It is aimed at biodiversity authorities and interest groups needing to select the most strategic development targets for biodiversity mainstreaming – to produce high gains for biodiversity as well as development, reduce any negative impacts, and accelerate the process of institutional integration. Writing about biodiversity. Tips and templates for policy and media material Are you involved in trying to get biodiversity issues into development plans and policies? Are you wanting to raise awareness of the benefits of considering sustainable use of biodiversity with people in working in government ministries? Or perhaps you want to work with journalists to get more discussion in the media of the importance of biodiversity for development? This booklet provides advice for writing for these audiences, with practical tips that will give your content a better chance of being read. The importance of building relationships with the right people. Putting biodiversity at the centre of development: a checklist for reviewing the mainstreaming potential of a country's NBSAP. This short checklist provides a simple structure for reviewing a country's NBSAP to make sure it contains the essential ingredients for biodiversity mainstreaming. The content is grounded in the experience of the project members and is aimed at countries starting or in the process of revising their NBSAP (available in French and Spanish). Developing a business case for biodiversity. Tips and tasks for building a case for integrating biodiversity into decision-making processes and policy development in other sectors. The guide follows a simplified process for generating and presenting compelling evidence and is aimed at environment officials, practitioners and policymakers. Ten steps to mainstreaming biodiversity. Tips for revising your NBSAPs and to integrating biodiversity needs with development planning generally. Extracted from the Maun Statement below, this short booklet is for anyone wanting to know how to start the process of biodiversity mainstreaming. A rapid diagnostic tool: biodiversity mainstreaming – integrating biodiversity, development and poverty reduction. A tool for policymakers and others to understand the extent to which biodiversity and development objectives are already integrated at the national level, and the obstacles and constraints that need to be overcome to promote further, and more effective, integration. The tool is also available in French and Spanish. Biodiversity and Development Mainstreaming – a state of knowledge review. The review synthesises experience to date and highlights lessons learned that can support a strong business case for integrating biodiversity in policy, planning and budgetary processes. We invite your feedback to the review by emailing dilys.roe@iied.org.